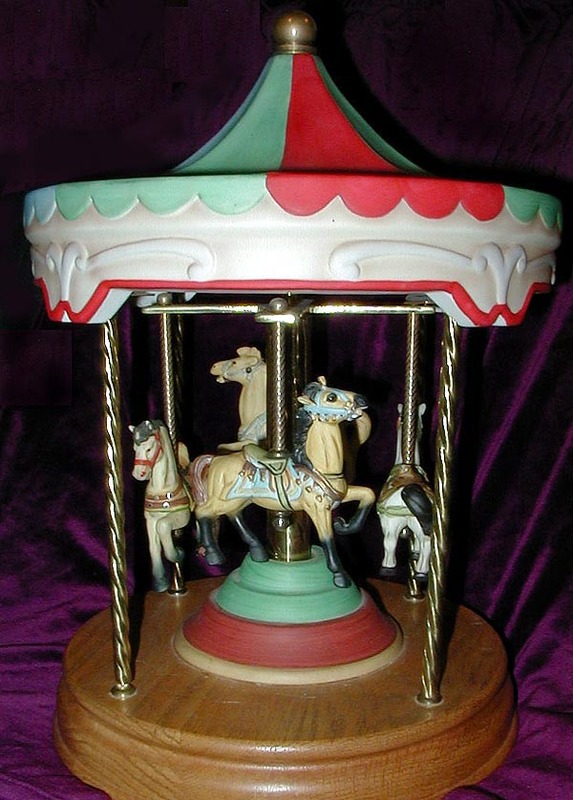 This was the first large carousel of this type that I ever personally saw. I remember very clearly when the shop I worked in at the time (in 1985) got our first shipment of four of these - I fully expected them to gather dust, figured they'd never sell at the price being asked ($250 at the time). But I was wrong - I couldn't keep them on the shelves, sold all four within the first month. This particular carousel shows horses from Dentzel and Muller, including my all-time favorite Muller horse, which is right upfront in this picture. These were not numbered and I've no idea how many of them were ever made. The music box plays "The Carousel Waltz" (as most all of the Willitts pieces of this time period did). The average price of this piece when new was $200-$300.